For busy families or career couples racing to get ready for work in the morning, a vanity with double sink basins can be a lifesaver. Creating a double-sink vanity top generally involves one of two scenarios: Either you are installing an all-new countertop, probably one that already has two basin cutouts; or you are installing a second sink alongside the first sink by cutting an opening in the countertop and adding the water supply and drain lines to serve the new sink. This second scenario is what we'll describe in this project. According to ImproveNet, this bathroom improvement cost roughly $400, on average. There are certainly much more complicated plumbing improvements that DIYers perform, but adding a second vanity sink does require some broad plumbing skills and experience. Consider what is involved before you tackle it. Take into consideration your countertop material. Laminate or solid-surface counters are fairly DIY-friendly when it comes to cutting an opening for a second sink. 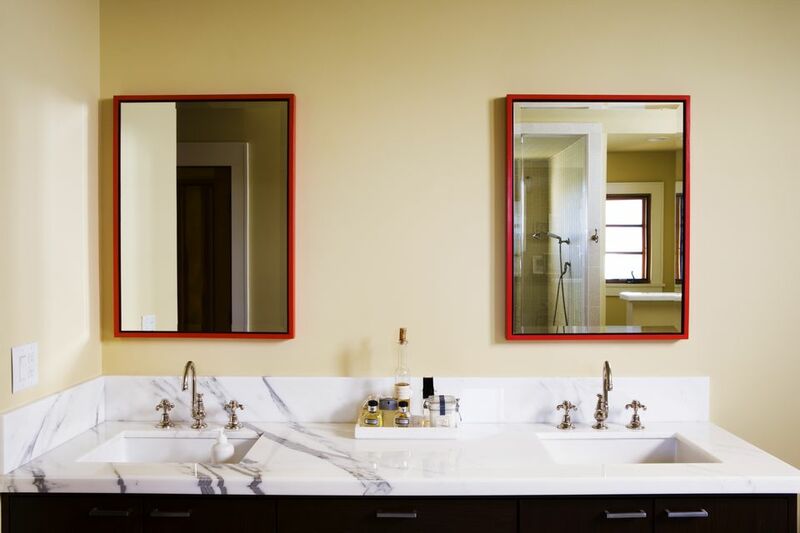 But cutting a granite, quartz, or marble vanity top is almost always a job for a professional. Dangerous dust particles and cracking are two potential issues that professionals know how to deal with. A diverse range of plumbing skills is required since you will be connecting both water supply and drain pipes. Make sure you are equipped with all basic plumbing tools and general home workshop tools. Pipe materials may vary. While our project assumes PVC drain pipe and copper water supply connections, your own situation could be quite different. You could be dealing with galvanized steel, chromed brass, CPVC water piping, or PEX tubing—you might even be dealing with all of them in the same project. Before tackling this project, have a look at the plumbing pipes beneath your sink and make sure you are comfortable with the skills you'll need to work with them. This is an involved bathroom improvement project that is best handled with patience. To avoid undue stress, DIYers should plan to devote the better part of a weekend to the tasks. For this phase, we'll assume you have a laminate or solid-surface countertop, both of which can be cut fairly easily with a jigsaw. If you want to use the same drain trap for both sinks, as we've done here, there should be no more than 30 inches between the sinks. For comfortable use for two side-by-side users, there should be at least 24 inches of space between the sinks. Measure the shape you need to cut out on the existing countertop. Sink manufacturers may provide a cardboard template that you can use to mark the countertop for cutting. This will vary depending on whether the sink is a drop-in, vessel, or under-mount. Proper alignment and spacing in relation to the existing sink are critical here—make sure there is the proper amount of space between the basins, and that they positioned with the same front-to-back spacing on the countertop. Once the sink opening has been outlined on the countertop, drill a hole through the countertop inside the outline area. The hole needs to be large enough to fit a jigsaw blade. Using a jigsaw, cut along the outline to complete the cutout for the sink. Test-fit the new sink to ensure it fits. It is generally easiest to install the faucet and drain fitting in the new sink now, before inserting it in the cutout opening. Because the faucet tailpieces can be hard to access once the sink is placed in the countertop, it's also a good idea to pre-attach water supply tubes to the faucet tailpieces. Mount the faucet on the sink. This involves inserting the faucet tailpieces through the holes on the sink, then threading the mounting nuts onto the tailpieces from the underside of the sink. With some faucets, you will apply a thin layer of plumber's putty between the base of the faucet and the sink. Other faucets have a foam or rubber gasket that makes putty unnecessary. Attach flexible water supply tubes to the hot and cold tailpieces on the faucet. Make sure the tubes are long enough to reach from the sink location to the existing shutoff valves below the countertop. Tighten the supply tubes to the tailpieces using an adjustable wrench or basin wrench. Install the drain assembly on the sink, following the manufacturer's instructions. With most drains, a bead of plumber's putty is placed around the drain opening, then the drain assembly is inserted into the drain opening, and the mounting nut is threaded onto the tailpiece from below the sink. Use channel-type pliers or a pipe wrench to tighten the tailpiece down securely. Some tailpieces and mounting nuts are made with plastic, so take care not to break the parts by overtightening. Wipe away any plumber's putty that has squeezed out from around the drain fitting flange in the bottom of the sink. Insert the sink into the countertop cutout, following manufacturer's instructions. This usually means applying a bead of silicone caulk around the cutout opening, then lowering the sink into place. Some styles of sink may have brackets that are installed below the sink to hold it in place against the countertop. Under-mount sinks have yet another method of securing them. If necessary, run a bead of caulk around the seam between the rim of the sink and the countertop. Wipe away any excess caulk using a damp rag. The next step will be under the sink, adapting the drain trap configuration so it can accept two sinks. Where the sinks are 30 inches or less apart, they can be served by the same P-trap. We are plumbing the drain configuration with PVC pipes, but where the underside of the sink is exposed, you may want to use chrome pipes for the drain hookups. Most bathroom sinks use 1 1/4-inch trap parts, but you may find some with 1 1/2-inch drains. Various transition fittings may be necessary, depending on your situation. Disconnect the drain pipes and drain trap on the bottom of the existing sink, using channel-lock pliers. In some cases, you may need to cut the pipes free using a hacksaw. Remove the tailpiece extension that drops down from the existing sink, the P-trap, and the trap arm that runs into the drain opening in the wall. Now you will assemble the pieces for linking both sink drains to a single P-trap. Normally, the drain trap configuration will include 90-degree elbows on the bottom of each drain tailpiece, joining to a tee-fitting. From the tee-fitting, a short pipe leads to the P-trap. The outlet on the P-trap is joined to the drain opening in the wall with a trap arm pipe. Make sure the trap arm leading into the drain opening is pitched downward at a slope of about 1/4 inch per foot. This will ensure proper drain flow. You may need to make adjustments at this point, possibly cutting off the drain tailpieces or adding extensions to create the proper downward slope. Once the PVC drain pipes are satisfactory, tighten all slip-joint connections using channel-lock pliers. The final step is to connect the water supply lines. This will mean replacing the existing fixture shutoff valves with double-outlet shutoff valves that can feed both sink faucets. Shutoff valves come in many styles, including those that are soldered onto copper water supply stub-outs. The easiest types to use are those with simple compression fittings or push-fit connectors that grip onto the water supply stub-outs. Choose whatever type of shutoff valves that are appropriate for your pipes. Shut off the water at the main shutoff valve. Place a bucket under the water supply valve below the existing sink. Disconnect the supply tubes serving the existing sink from the shutoff valves, using channel-type pliers or an adjustable wrench. This may require two wrenches; one to hold the valve, the other to loosen the mounting nut on the supply tube. Remove the fixture shutoff valves from the water supply stub-outs. Normally this is done by loosening the compression fitting nuts with a wrench. If the valves were soldered in place, you may need to cut off the valves, using a hack saw. Attach the new dual-outlet shut-off valves to the water supply stub-outs, following manufacturer's instructions. With compression-style valves, this means fitting a compression ring and compression nut onto the pipe, then securing the valve by tightening the nut with a wrench. Push-fit connectors simply slip onto the end of the stub-out pipe. Attach the free end of each faucet supply tube to the proper valve, using an adjustable wrench. Make sure to properly match the hot water supply tubes to the hot water shutoff valve, and cold to cold. Open the main water supply valve. Open the fixture shutoff valves and test the faucets on both sinks. Watch for leaks both in the water supply fittings and the drain fittings. Tighten any connections that have leaks. Usually, only a very small amount of tightening is necessary.